One of the best things about writing this blog is being introduced to a wide range of authors. Some are well-known, some are new, some are new to me. Joe Abercrombie falls in to that last category. Where have I been? Why am I not more familiar with the name Joe Abercrombie? I recognized the name from one of my favorite short stories in THE BEST SCIENCE FICTION AND FANTASY OF THE YEAR: VOLUME EIGHT … “Some Desperado.” In fact it was having read that story that prompted me to seek out a book by him, this being that book. The world of Half a King is a violent medieval or even Viking/Norse land with kingdoms that are either at war or sitting on a tenuous peace with one another. Here, Prince Yarvi, born the second son, never expected to become a king. But when he does, he immediately faces a backlash from his subjects who look on him as half a king due to the fact that he was born with a crippled hand which could never hold a sword or a shield. This is the sort of land where a king must be strong enough to fight to defend his crown. Yarvi is not a fighter. Not strictly by brawn anyway. Yarvi is overthrown and sold as a slave to a ship captain who lashes him to an oar and forced to row. Yarvi uses cunning and guile to survive and he vows to find a way to not only survive but to return to his kingdom. Joe Abercrombie’s characters are well-defined, fully realized, three-dimensional characters. Yarvi is not a good-guy hero all dressed in white, which is what makes him interesting. He is flawed, both physically and emotionally, but despite the lack of a hand, he is a fighter. His constantly pushing forward and looking for opportunities (when not creating his own opportunities) is inspirational. But part of what makes these characters so nice is that they are not pitted against unbelievable odds. Abercrombie understands how much to push and pulls back just enough so that his characters don’t seem super-human. This is trickier than you might think, but Abercrombie handles it masterfully. There are also some nice twists and turns within the story and I was most definitely caught off guard more than once (in a good way). I will most certainly be reading more Joe Abercrombie and I recommend this fantasy most heartily. Looking for a good book? 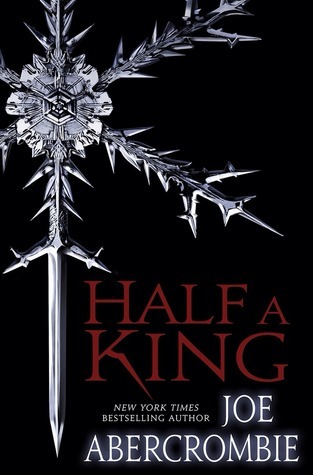 Half a King is an extremely well written fantasy that will appeal to teens and adults alike.